Built on seven hills, Lisbon has experienced a renaissance in recent years, making it the cultural star of Portugal. Your day-by-day itinerary now includes Bairro Alto. 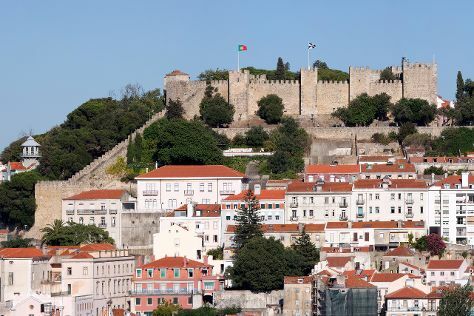 Kick off your visit on the 6th (Mon): step into the grandiose world of Castelo de S. Jorge, take a stroll through Rossio Square, get engrossed in the history at Carmo Archaeological Museum, then steep yourself in history at Belém Tower, and finally admire the masterpieces at Museu Calouste Gulbenkian. Get ready for a full day of sightseeing on the next day: admire the landmark architecture of Jeronimos Monastery and then wander the streets of Bairro Alto. To see traveler tips, ratings, other places to visit, and more tourist information, read our Lisbon journey planner. If you are flying in from Brazil, the closest major airport is Humberto Delgado Airport (Lisbon Portela Airport). In May, plan for daily highs up to 28°C, and evening lows to 15°C. Cap off your sightseeing on the 8th (Wed) early enough to go by car to Lagos. 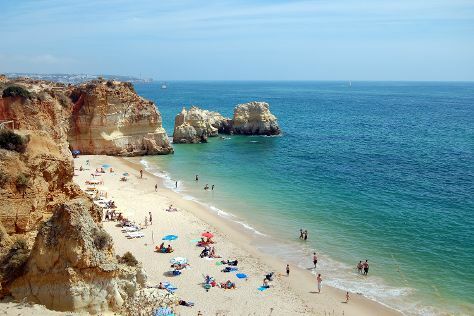 The allure of the beaches and the town's historical center draw visitors to Lagos, a coastal destination in the Barlavento region of the Algarve. To see more things to do, other places to visit, maps, and other tourist information, read our Lagos trip planner . Getting from Lisbon to Lagos by car takes about 3 hours. Other options: take a bus; or do a combination of flight and bus. In May, daily temperatures in Lagos can reach 28°C, while at night they dip to 18°C. Wrap up your sightseeing on the 10th (Fri) early enough to drive to Evora. The city of Evora functions as a museum of Roman origins and medieval times. To find traveler tips, maps, reviews, and more tourist information, read Evora trip itinerary planning tool . Traveling by car from Lagos to Evora takes 3 hours. Alternatively, you can take a bus; or do a combination of bus, flight, and train. Plan for a bit cooler nights when traveling from Lagos in May since evenings lows in Evora dip to 13°C. On the 11th (Sat), wrap the sightseeing up by early afternoon so you can drive to Coimbra. The university town of Coimbra exudes modern flair while embracing its roots as the medieval capital of Portugal. To see ratings, reviews, maps, and other tourist information, read Coimbra tour builder app . Drive from Evora to Coimbra in 3 hours. Alternatively, you can take a train; or take a bus. Expect slightly colder weather when traveling from Evora in May: highs in Coimbra hover around 24°C, while lows dip to 13°C. Cap off your sightseeing on the 12th (Sun) early enough to catch the train to Porto. Called "Oporto" by many, the city of Porto along the Duoro River lent the country and Port wine their names. Portugal's second-largest metropolis dates back to the 4th century, representing both a rich cultural past and industrial present through its architecture and style. Start off your visit on the 12th (Sun): tour the pleasant surroundings at Praia de Miramar, then learn about winemaking at Porto Augusto's, then admire the landmark architecture of Palacio da Bolsa, and finally take in the spiritual surroundings of Porto Cathedral (Se Catedral). On the next day, stroll through Torreira Beach, then take in the spiritual surroundings of Capela das Almas, and then contemplate the long history of Largo da Oliveira. To find traveler tips, ratings, and tourist information, use the Porto trip itinerary maker app . Traveling by train from Coimbra to Porto takes an hour. Alternatively, you can drive; or take a bus. In May, daytime highs in Porto are 23°C, while nighttime lows are 13°C. Finish up your sightseeing early on the 14th (Tue) so you can travel to Braganca. Bragança is a city and municipality in north-eastern Portugal, capital of the district of Bragança, in the Alto Trás-os-Montes subregion of Portugal. Start off your visit on the 14th (Tue): see the interesting displays at Museu Do Abade De Bacal, then take in the exciting artwork at Historia e Arte, then examine the collection at Museu Iberico da Mascara e do Traje, and finally take a stroll through Rio de Onor Village. To see more things to do, ratings, reviews, and tourist information, you can read our Braganca online trip maker . Traveling by car from Porto to Braganca takes 2.5 hours. On the 15th (Wed), wrap the sightseeing up by early afternoon so you can travel to Burgos. Burgos is a city in northern Spain and the historic capital of Castile. For reviews, traveler tips, photos, and other tourist information, use the Burgos day trip planning website . Drive from Braganca to Burgos in 3.5 hours. Due to the time zone difference, you'll lose 1 hour traveling from Braganca to Burgos. In May, daytime highs in Burgos are 20°C, while nighttime lows are 6°C. On the 16th (Thu), you'll travel to Santo Domingo de Silos. Santo Domingo de Silos is a municipality and town located in the province of Burgos, Castile and León, Spain. 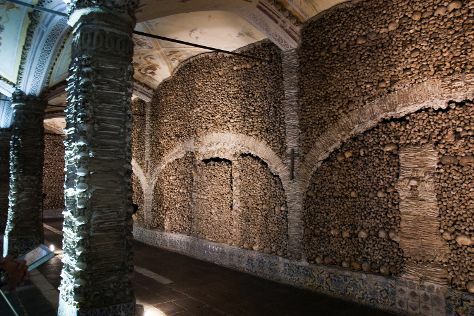 Start off your visit on the 16th (Thu): examine the collection at Museo de los Dinosaurios, see the interesting displays at Centro de Visitantes del Arbol Fosil de Hacinas, then explore the historical opulence of Castillo de Castillejo, then look for gifts at El Roble Azul, and finally take in the architecture and atmosphere at Iglesia Santo Tomas. Get ready for a full day of sightseeing on the 17th (Fri): take in the spiritual surroundings of Monasterio de Santo Domingo de Silos and then play a few rounds at Club De Golf Lerma. For where to stay, more things to do, traveler tips, and tourist information, refer to the Santo Domingo de Silos attractions site . You can drive from Burgos to Santo Domingo de Silos in an hour. In May, plan for daily highs up to 20°C, and evening lows to 6°C. Finish your sightseeing early on the 17th (Fri) to allow enough time to travel back home.